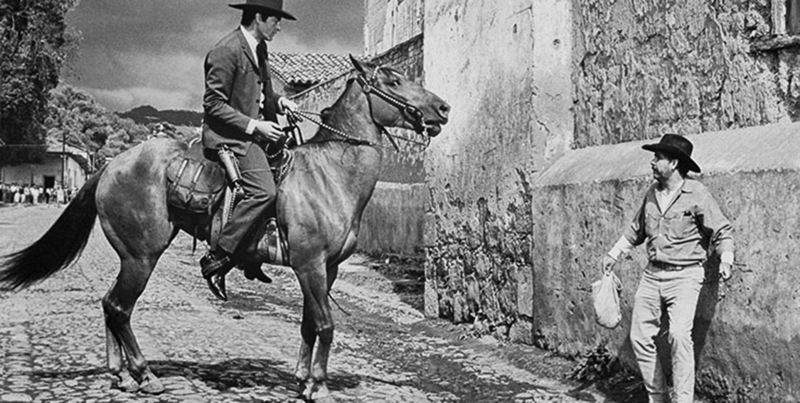 Released widely in 1966 to critical acclaim throughout Mexico, Tiempo de morir (Time to Die) marked an auspicious directorial debut for a then 22-year-old Arturo Ripstein. The film, shot in black and white, was co-written by Gabriel García Márquez and Carlos Fuentes, two writers who would eventually achieve near mythical status as internationally acknowledged literary giants. Produced and distributed by Alameda Films—the company founded in 1948 by Alfredo Ripstein, the novice director’s father—it cemented the reputation of the Ripstein dynasty and established its founder and his sons as the leading proponents of a national film industry comparable only to Hollywood in terms of artistry and commercial viability. On August 5th, several hundred serious Latin American film and literature aficionados gathered for a rare screening of Tiempo de Morir in commemoration of the film’s 50th anniversary. Presented by the Boyle Heights-based Libros Schmibros Lending Library, the classic Mexican western drew an eclectic cross-section of cinema scholars, curiosity seekers, season ticket holders, independent filmmakers and Chicano arts community stalwarts to the John Anson Ford Amphitheatre for the once-in-a-lifetime opportunity to see Ripstein’s dark and profound meditation on crime, punishment, honor and the elusive nature of redemption. Director and screenwriter Rodrigo García (Things You Can Tell Just by Looking at Her, Nine Lives), son of the Colombian Nobel laureate for literature who partnered with Mexico’s Fuentes (The Old Gringo, Where the Air is Clear) to pen the script, took to the stage at the newly renovated Ford theatre to discuss the film and his father’s role in the project with Los Angeles Times film critic Mark Olsen. The distinguished pair were introduced by Libros Schmibros founder David Kipen, a former book reviewer at LA’s Daily News and the San Francisco Chronicle who later became a director of literary programs at the National Endowment for the Arts in Washington before downsizing brought him back to his native LA. Over the years, he had amassed a substantial book collection in his role as a nationally recognized book critic. He was inspired to bring his books to Boyle Heights and open up a ramshackle storefront lending library as the “book vato,” said Kipen, when he saw a notice announcing that the Benjamin Franklin branch of the Los Angeles Public Library on East 1st Street would be reducing its hours of operation. Making books available and loaning them out for free to neighborhood residents during diminished summer access to the local library, Kipen once explained, was the best way to honor the community that had once been home to his grandparents. In a conversation naturally centered on his father—the revered writer known simply as “Gabo” and acclaimed author of the quintessential Latin American novel Cien años de soledad (One Hundred Years of Solitude), Rodrigo García offered a uniquely personal perspective. Though his father’s collaboration with Fuentes on the screenplay for Tiempo de Morir is a primary reason for a resurgent interest in the film, its premise originated with his father, García explained. According to him, Fuentes was enlisted to help develop the dialogue and thus ensure that the film would resonate with Mexican audiences even as it posed a radical shift from the movies that starred singing charros—mounted mariachi cowboys with hearts of gold—who vanquish the bad guys while proving that loyalty, friendship and humility were among the most noble virtues a hero could own, before riding off into the sunset with the girl whose honor he and his most trusted companions had fought to protect. In contrast, Ripstein’ s film opens with a man who has spent 18 years in prison for murder making his way on foot to a small town situated in an arid Mexican desert where horsemanship and honor are prized as the highest expressions of manhood. Unfortunately, the distorted code of honor that greets the film’s humble protagonist is rooted in the shifting sands of memory, pride and madness that wreak havoc on the traditional good versus evil narratives that make heroes and villains easy to identify. The protagonist, played by Jorge Martínez de Hoyo, returns to the hinterland only to face reprisals from the family of the man he killed in a duel and for which he has sacrificed both love and freedom. He teeters on a tightrope toward fate or destiny. Making his way back through the unforgiving heat of an inhospitable wasteland, he begins his homecoming with a symbolic journey through hell in the sense that he must bear the past and the people in it like a cross on his shoulders. It is a pilgrimage punctuated by the woeful notes of an oboe and a lonely guitar in a score composed by Carlos Jiménez Mabarak. He reaches the city which bore witness to his long ago crime in hopes of making a fresh start with the woman to whom he had promised himself before his sense of integrity and dignity drove him to commit the crime for which everyone—with the exception of the victim’s two grown sons—is prepared to forgive him after nearly two decades of incarceration. This is a cowboy story that makes no pretense of masking its basis in a Shakespearean-style drama where a lust for vengeance perpetuates a dark and inevitable cycle of violence that culminates in tragedy. With its bleak, aching shots of long empty streets and decaying structures that demonstrate the futility of man’s efforts to tame nature, the film evokes Italian neo-realism. The barren, harsh landscapes and the narrow cobblestone streets devoid of all but a few passersby or stoic indigenous women selling their wares are juxtaposed with images of virile and attractive men on horseback, symbols of power and privilege like centaurs who must duel to the death according to an ancient, inescapable genetic disposition. As they ride inexorably toward a collision that will leave no one unscathed, the men astride the majestic beasts are doomed to repeat the sins of their fathers. 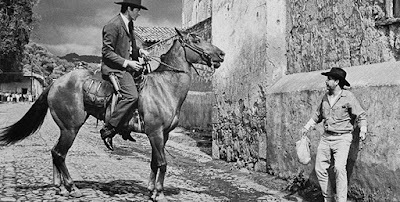 While not commonly acknowledged, Tiempo de Morir is an obvious precursor to the Sergio Leone “spaghetti westerns” which catapulted actor Clint Eastwood to fame. Juan Sayago, the ex-convict who wants only to live out the rest of his days in peace, is the anti-hero forced to become an outlaw (foreshadowing Josey Wales a full decade before) by circumstances he can’t outrun. The drama unfolds in a Mexico where the original cowboys, the vaqueros who bequeathed their skills and jargon to their Anglo counterparts north of the border and should thus be acknowledged as the truest fathers of a limitless genre in film and literature. Had it not been for the original Mexican cowboy tradition, the “western” would not exist. And as the result of the palpable and tangible resonance of the “western” as a cultural juggernaut that defined a significant part of this country’s history, the world gave us John Huston, Eastwood and a wealth of celluloid stories that could easily be described as existential parallels to the troubling Ripstein film. But there is something else. Tiempo de Morir is a human story of love and self-respect that unfolds in a world that transcends culture and geography. Death permeates the sandstorms and the language as an ominous phantom floating across the generational divide. Women have power to envision a way out, but they are trapped within the tight corsets of a society dominated by stoic, unyielding men. They share their observations and advise the men they love, men too consumed by egotistical myopia, vanity and hubris to appreciate the wisdom offered by the women in their lives. Notions of trust, rectitude and courage unravel in a place and time akin to a cultural vacuum where a man’s word is his bond but whose actions often reduce the value of his word to nothing. Death takes up residence even closer to a man’s life than the promise of tomorrow’s sunrise.